Dr. Gloria Stevens and Dr. Ronald Liskanich are Board Certified Dermatologists serving Upland, Rancho Cucamonga, Claremont and surrounding communities for 26 years. Our faculty appointments at USC and Western University keep us on the cutting edge of dermatologic knowledge. At our office, you will be seen by a physician, as we do not employ physician extenders. Our goal is to provide exceptional skin care for our patients. 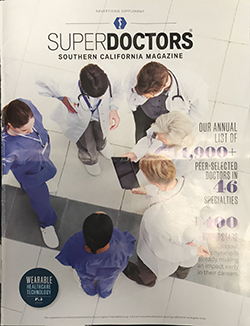 Dr Gloria Stevens is proud to be named a Super Doctor for 2019 by the Southern California Magazine. Dr. Stevens was also listed as a Super Doctor in 2018, 2017 and 2016. At Aesthetic Spa M.D., we customize skin care treatments for each patient in a beautiful, comfortable setting. For more information or to schedule a consultation please call 909.949.7500 today.